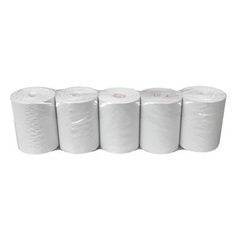 Thermal recording paper rolls that can be used for Marco/Nidek Auto Lensmeter LM-750/770/820/990A, Nikon Auto Lensmeter NL-1, Tomey Auto Lensmeter TL-100 - 2000A/3000A, VEP/ERG PE-300/400. Roll measures 1.46" wide with a diameter of 1.1" and a core diameter of 0.27". Manufactured by Amcon. Comes 5 per pack.